This five issue series returns to the comic mythology of Deadpool’s Secret Secret Wars and introduces further welcome twists. The premise of this new series is that Deadpool, little did we know, had bonded with the symbiote that became venom before Spider-Man’s own metamorphosis. 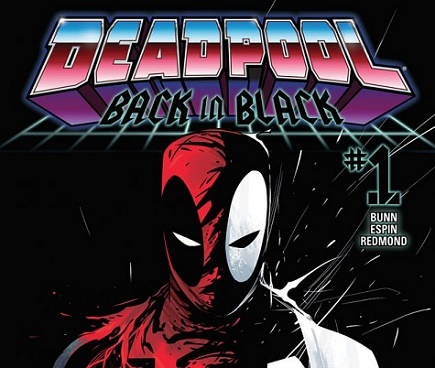 This second edition certainly displays some of the trademark humor that readers typically expect from a Deadpool comic. Wade Wilson teams up with a new character, Obnoxio the Clown, and a group of juvenile super heroes that may be familiar to audiences who appreciate 1980s comics. The Power Pack are a superhero team that were originally showcased by Marvel Comics back in 1984, who are fortunate to make the acquaintance of Deadpool. Reptilian aliens called the Snarks are harboring some devious intentions. The Snarks are adversaries of the Power Pack, and only one nearly indestructible hero can stop them. At a children’s birthday of all places an alien space ship appears and the reptilians make a dramatic entrance. The resulting action sequences see Deadpool transformed into his symbiote semi-alter ego and causing much mayhem aboard the alien vessel. 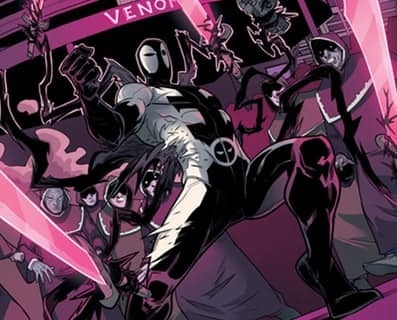 We learned in the first issue, the symbiote bonded with Deadpool at Club Venom nightclub, during what was proving to be a very difficult physical encounter with cyborg cultists. Deadpool gained a cool new all black look and some new found abilities, from tentacles to Spider-man reminiscent web shooting. It seams that the symbiote rather than turning Deadpool in an even worse version of himself, has actually positively influenced Wade Wilson to be less mercenary and play the role of good guy again. For now anyway. Cullen Bunn has scripted an entertaining segment with plenty of comedic one-liners and bristling energy. Humerous interludes allow for playful jabs to be taken at Spider-Man, not least the Mouthy Merc’s dissatisfaction at being mistaken for the webcrawler. Sufficient time is taken to delve into character development and lend full reign to the idiosyncratic personalities of the contrasting individuals, without unnecessarily rushing plot explanation. The episode did not reveal any major turning points, but it seems likely that the next issue will be more forthcoming. We understand that other recognizable comic personalities will be dropping in on Wade Wilson, including Black Cat.